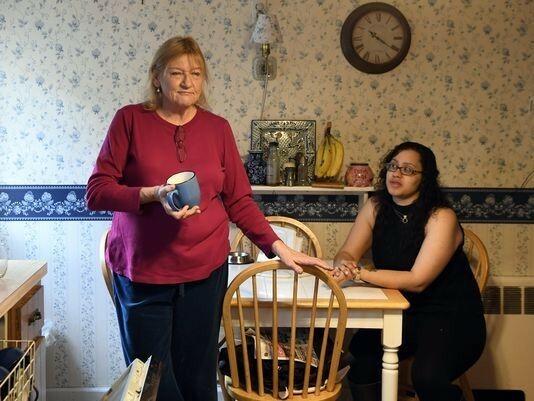 The two women are four decades apart in age – one a recent retiree worried about the high cost of living in the home where she raised her daughter, the other a 20-something working two jobs while trying to finish school in one of the most expensive rental markets in the country. A computer likely wouldn’t spit out these two profiles as a potential roommate match. 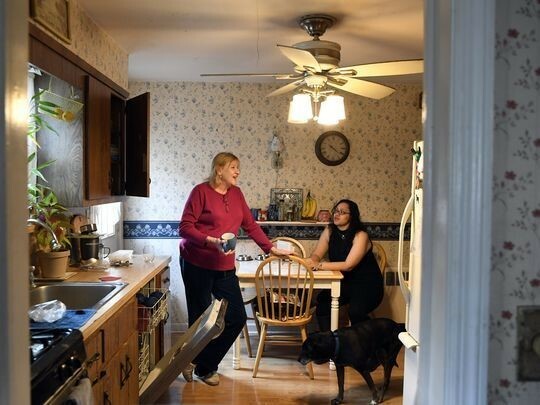 Nevertheless, Joan Grzenda, 66, and Alyssa Camacho, 26, are amicably sharing a three-bedroom home in Bergen County (they prefer not to name the town) in an arrangement that, for now, has solved each of their very different housing problems. Before the two were introduced six months ago through an Englewood-based home-sharing program, Grzenda was an empty-nester not yet ready to be uprooted from the home she’s owned for 23 years, although the taxes and upkeep were becoming too heavy a financial load. Camacho’s worries were more immediate – she was technically homeless, having spent several months on the couches of family members and even spending a few nights sleeping in her car. Home-sharing is far from a new concept, but as North Jersey’s population grows older, the region’s high cost of living has turned the phrase into something of a buzzword among advocates looking to ease the pressures of older homeowners who either can’t afford or don’t want to downsize into an easier-to-manage apartment or condo. There can be downsides: Because these arrangements are informal, there is no lease nor the legal protections offered by one — a necessity in order not to violate the rules many towns have about renting rooms in single-family homes. But proponents say the concept of sharing, instead of renting, can also help younger people like Camacho, who work or go to school in North Jersey but can’t afford the region’s typical rents — about $1,200 a month for a one-bedroom apartment, according to a 2016 study by the National Low Income Housing Coalition. “Lack of affordable housing choices is a problem for all generations,” said Julia Stoumbos, program officer for the Henry and Marilyn Taub Foundation, a Teaneck-based philanthropy that funds programs that assist both older and low-income residents. Many advocates for the aging say home-sharing could be an option for older North Jerseyans grappling with property taxes that are among the highest in the country. Those same advocates, however, recognize that such arrangements will only be successful if homeowners – and those seeking to share a home – get assistance on how to find a good match. Rather than being the makings of a lighthearted situation comedy, a la “The Golden Girls” hit television series of the 1980s, home-sharing arrangements can be fraught with challenges, particularly if the homeowner and home-seeker are used to different lifestyles. Opening up your home to a “friend of a friend of a friend’ or answering an ad on craigslist can bring regrets, as Micki Shilan, 82, of Teaneck can attest. At present, all is well in Shilan’s home, which she has been sharing for about three years with the son of a good friend. The man, who is in his 60s, is so quiet and respectful that Shilan hardly knows he’s there. But Shilan had several bad experiences before she found her current situation, including one in which a former female roommate pulled a knife on her. Homesharing Inc., a Bridgewater-based non-profit that serves all or parts of seven New Jersey counties, expanded its territory two years ago to include a sliver of Passaic County – Clifton and Little Falls. The only non-profit providing such help in Bergen is the Women’s Rights Information Center in Englewood. For years, the Englewood center, which offers an array of assistance programs to women in distress, has been quietly helping to place those who are homeless, or on the verge, with those who are struggling to afford their longtime homes. Susan Bendes, a part-time center employee who runs the program, said she typically makes one or two matches a month. In each, she spends a lot of time talking to both the homeowner and the home-seeker about the nitty-gritty details of sharing space: How late is OK to use the kitchen? Is it OK to leave clothes in the dryer overnight? Whose job is it to take out the garbage? How about playing music? Watching TV? Smoking? Keeping pets? The more she can get both individuals talking about their living habits, the better the chance that a match will not only be made but last for a while. The living agreement form she asks both parties to sign is six pages long. While they may be strangers in the beginning, both home-seeker and homeowner need to develop trust, as well as good rapport, since these are informal living agreements, Bendes said. In their short time together, Grzenda and Camacho, who were matched by Bendes, say they haven’t really argued over anything despite having different tastes in everything from food to television programs. In truth, because of their separate work schedules, the two are rarely home at the same time. Camacho’s two jobs keep her working Monday through Saturday, often until 9 p.m. So most nights, Camacho arrives home to make dinner hours after Grzenda, who is retired but still works three to four days a week as a substitute teacher, has already eaten. Culturally, they are both products of their separate generations. Grzenda has a couple of favorite prime-time programs she considers “must-see,” while Camacho live-streams shows on the X-Box in her room. Camacho has her own bedroom and bathroom on the second floor, the first time she’s ever had that much space to herself, and said she gets along well with Grzenda and her dog and two cats. “From the first moment I met Joan, I felt comfortable with her,” Camacho said. In making home-sharing matches, Bendes said it’s important that both individuals are looking for the same type of relationship. Some want it to be businesslike arrangement, where each person is respectful of the other but they don’t interact much in each other’s lives, while others want company and companionship. The Englewood agency has been offering free home-sharing assistance since the 1970s, and in that time matches have been made between young and old, old and old, and even families with young children looking to help make ends meet by finding someone to live in a spare bedroom. The program also serves men seeking home-shares. It is one of a handful of non-profits in the state that offer such assistance to potential home-sharers. The largest is Homesharing Inc., which started in 1984 in Somerset and Hunterdon counties and now has 1,700 active home-sharing matches in seven counties, said executive director Lisa Blum. The agency is open to the idea of expanding again to serve clients in Bergen and in the rest of Passaic County, Blum said. At the same time, the Taub Foundation has recently begun exploring whether there is a need to provide seed money for more home-sharing assistance in the Bergen-Passaic area as part of a multi-town initiative to make the suburbs more “age friendly,” Stoumbos said. Besides the financial incentive of sharing living costs, senior homeowners struggling to keep up with chores like snow-shoveling, yard work and grocery shopping could build a shared-chore arrangement into a home-share, thus curing some of their other housing headaches, Stoumbos said. Bendes thinks it is wise for senior advocates to start marketing the idea of home-sharing to seniors struggling to get by on their own.